St. Albans students fascinated by the new tablets. Thirty-two Class 3 students at the St. Albans Primary School got the surprise of their lives this morning, when each of them and their two teachers were presented with tablets. The donation, made by the Aron and Christina Truss Foundation with assistance from IQS Capital Management which donated the tablets, was part of their thrust to continue promoting and facilitating the education of children at the primary and secondary levels. Aron Truss told the students that they recognised that most charities spent 40 to 70 per cent of what they made on administration, so very little went towards the causes intended. In this Foundation’s case, he noted that both he and his wife handled their own administration, so 100 per cent of what was donated went towards children’s education. “We have selected children in Class 3 as we feel that they are old enough to handle the responsibility of taking care of the tablet and will have it for two years to assist them with their preparations for the Common Entrance Exam. 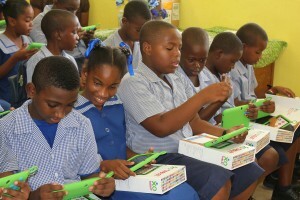 The tablets come with many pre-loaded educational activities and are also full android tablets,” he said. Truss said he was confident the devices would help improve the children’s academic performance and that the teachers would be able to use them as a teaching tool and incorporate their use into the curriculum. He noted that they intended to give between 150 and 200 XO tablets to schools here this year. MP for the area, Edmund Hinkson thanked the Foundation and IQS, for the donation, noting the good it would do in the school. He told students with all the debate currently about education, that they should take full advantage of their opportunities and once they were in a position to do so, to give back of their time and service to the country. Even now, he told them they could do their part to give back by volunteering in their communities, helping family and friends. He said as well that the country needed more people who had benefitted from education to lend a helping hand now that Barbados needed it. Principal Angela Ramsay extended her own thanks to the foundation and IQS as well as the representative for thinking of the school as one of the choices for the donation.